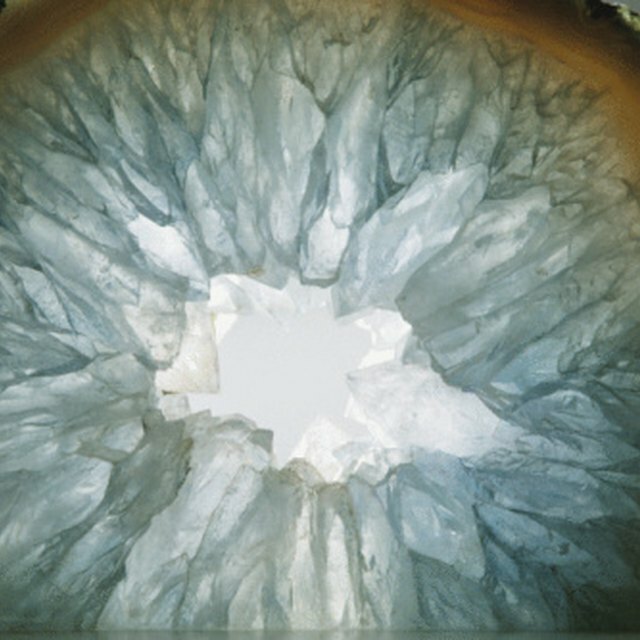 Growing crystals serves as a way for students and children to learn about geology and how crystals and rock formations form over thousands of years. They can also experiment to see how different materials (sugar, salt and alum) make different kinds of crystals, as well as use different foundation pieces (yarn, pipe cleaners, bamboo skewers) to see how they affect how the crystals grow. However, without the right conditions, your crystals may not grow at all. While crystals don’t require much beyond patience, there are certain things you can do to make sure your experiments are successful. No matter what material you choose, your water must be supersaturated with it for crystals to grow. This means you must dissolve as much of your chosen material into your water as possible. Materials dissolve faster in warm water, so it works better than cold, since the molecules move more in warm water. Simply pour one spoonful of your material at a time into the warm water and stir vigorously until it disappears. When your materials no longer disappear and settle on the bottom of your jar, the water is supersaturated and ready to go. Porous materials work best as foundations for your crystals to grow easily. The air spaces allow the dissolved material to gain plenty of surface on the foundation material and attract more dissolved material as the water evaporates and leaves the solid crystals behind. Rough bamboo skewers, yarn, thread, ice cream sticks, pipe cleaners and even fabrics work very well as crystal foundations. Pencils, paper clips and other very smooth, dense materials will not work because there is nothing for the crystals to grab onto. Nylon thread and fishing line only work if you tie a seed crystal to the end; even then, the crystal will grow in one place instead of climbing the material. Because warmth is key to forming crystals, the jar’s surroundings should be warm also for optimum crystal growth. Warm air temperature aids water evaporation, causing the crystals to grow more quickly. Crystals will still grow in cooler temperatures, but it will take much longer for the water to evaporate. Crystal growth also requires light. Again, the crystals will eventually grow in the dark, but it will take a very long time. Light evaporates water as heat does; combine them by placing your jar on a warm, sunny windowsill and you should have crystals in a few days. All Science Fair Projects: In Which Temperature do Crystals Grow Best? Shoop, Megan. "The Best Growing Conditions for Crystals." Sciencing, https://sciencing.com/growing-conditions-crystals-6621144.html. 26 April 2018.